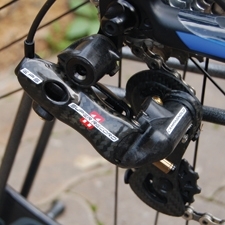 Shimano did it and as expected Campagnolo would follow suit. What about Sram? Sram at the moment doesn't seem interested. To me shifting is not a problem, its not a particularly hard function and I am not 100% with the idea of electronic shifting yet. The beautiful thing about a bike is its relative simplicity. Its basic form and function. The connection with the bike, your push on the pedals powering it forward, your sweep of the fingers to change gears. Adding electronic shifting seems so unnatural. From Bicycle Retailer and Industry News ... "LINGUAGLOSSA, Italy—When Valentino Campagnolo was ready to press forward on commercializing his company’s electronic drivetrain, he knew the culture inside Campagnolo’s Vicenza, Italy, headquarters would also have to shift. “It’s mandatory to have an electronics culture,” Campagnolo said in an interview during an early November press launch of its new Electronic Power Shift drivetrain.